Last Valentine's was the first Valentine's Day with my husband. I made these yummy vegan waffles, and little did I know I would become vegan a year later. 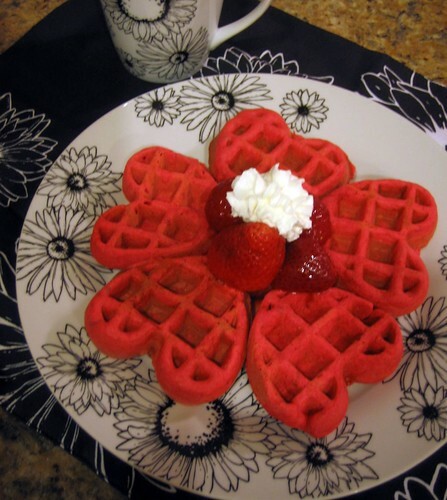 Since I'm building my own family traditions, I think I'm going to be making these every Valentine's Day. You can read the archived post here. Update: I'm submitting this to Anna's Much Love Monday Project! This weekend we are going to see The Wolfman (romantic, right? ), go to Disneyland, go to this conference, and play some Beatles Rock Band. I hope you have a great Valentine's Day this year! It's not about being single, married or whatever your relationship status is, it's about love. Funny how my outlook of it was last year. Plus, any excuse to celebrate love, pink, and heart shaped anything sounds like a great day to me! Have a great rest of your week and weekend!